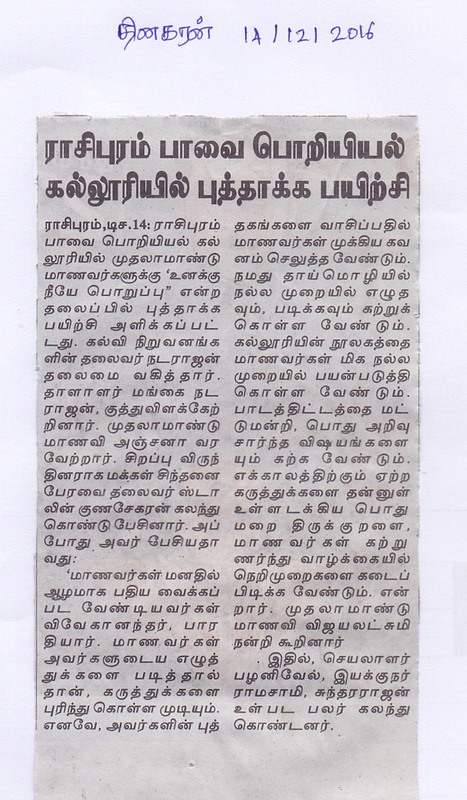 A Guest lecture programme on "TIME MANAGEMENT" was held on 14.09.2010 by the Department of Commerce, Pavai Arts and Science College for Women, Namakkal. Our Student Mrs. C.Pramila devi, welcomed the gathering. Shri.CA.N.V.Natarajan, Chairman, Paavai Institutions presided over the function. Student Miss.D.Obulakshmi, introduced the chief guest. Correspondent madam Smt.Mangai Natarajan and Dr.S.Muthu Meenakshi, Principal, Pavai Arts and Science College for Women made their presence in the function. Shri.CA.N.V.Natarajan, Chairman in his presidential address, appreciated the students for their active and enthusiastic involvement in all their activities and gave some important tips on the Event Management and Goal Setting. He also added that appreciation and rectification must be done on the spot of action itself. Dr.D.Kumaresan, Principal, Minerva College of Arts and Science, Jalakandapuram was the Chief Guest and delivered the guest lecture. In his lecture he said "We shouldn't blame Time for our trouble. Rather we should learn how to manage it. As three hands manages the clock to the show the time, three hands manages the time. They are planning, prioritization and performance. Planning constitutes scheduling the activities and preparing the 'to do list'. It also includes assigning apt persons for specific works. Priority occupies the next position. It can be classified based on urgency and importance of the activity. Priority should be given to the activities based on the time duration it consumes to be accomplished. Finally Performance perfects our activities. If you are idle you can't become an ideal". He concluded his speech by pointing out the distractions or barriers of achievement. He asked the students to avoid using mobiles to send unwanted messages which decline our vocabulary and spelling. He also insisted to prepare �What done list� to identify the activities which consume lot of time. Misuse of mobiles and internet are great disaster to mankind. Instead of wasting time using mobile and internet, new and current information can be acquired through them. Then our problems should be analysed and resolved using time management. The function concluded with the vote of thanks proposed by the first year student Ms.D.S.Agalya.